Christians ascribe attributes to God that aren’t based on the Bible. He’s omni-*. He’s omniscient. He’s omnipresent. He’s omnipotent. Let’s focus on omniscience. One of the claims of God’s omniscience is that he can see events for all time. However, the Bible doesn’t seem to me to make this claim and in fact argues against it in quite a few Bible passages. Christians proclaim everything bad we see in the world is a result of “the fall.” God is helpless to stop evil in the world because humans have “free will.” When God created Adam and Eve, he seemed surprised when they ate the fruit from the forbidden tree. Didn’t he know they would do this before he created them? The Genesis 3 passage in which God discovers Adam and Eve have eaten from the tree shows God to be on the same physical level as humans. He’s walking around the garden looking for them. He calls out, “Where are you?” He then seems not to know who told them they were naked. He then questions Eve, “What is this you have done?” Why did he have to ask? The first question you have to ask yourself in the Noah’s ark story is when God created man, didn’t he know they would “fall?” As you see above with Adam and Eve, he didn’t know ahead of time they would eat the fruit and in Noah’s day, he was apparently surprised by the evil in the world. He had to put a stop to it and start again. But if Noah and his family were perfect in his eyes, why didn’t he create them first instead of Adam and Eve? After all, in this genocide of humanity, he’s starting fresh anyway. After the flood, God creates rainbows to remind himself never to kill all of humanity again. He needs a reminder? What was the point of the genocide if we are still sinning now anyway? Did he think it was going to solve something? When God decided to kill Sodom and Gomorrah, Abraham pleads with him to spare the cities if he can find just 50 or 45 or 40 or 30 or 20 or 10 righteous individuals. Wouldn’t God know exactly how many there were at any moment in time? In the story of Job, Satan comes to God to chat apparently. During the conversation God asks Satan if he has taken note of Job and what a wonderful servant he is to God. Satan bets God that if Job loses everything he has, he will curse God. So God gives Satan permission to do anything he wants to his family and possessions but not to lay a finger on Job himself. In the end after Satan kills his family and servants and livestock, Job still worships God so God blesses him afterward. 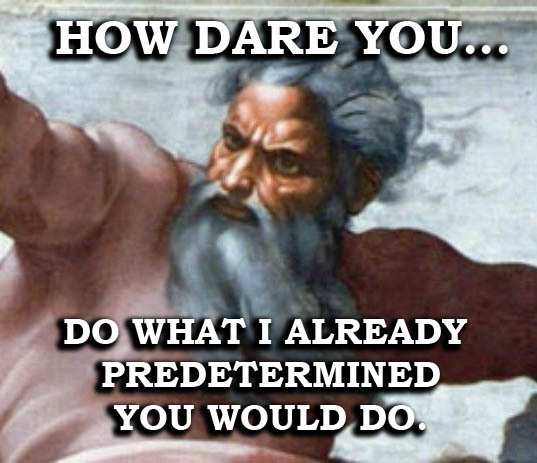 But didn’t God know what would happen before he made the bet? And furthermore, Satan should know all of God’s powers. Why would Satan make bets with an omniscient being? On a side note, in the Bible God kills or orders killings of millions and millions of people. This is Satan’s only documented killing in the Bible and he did it in accordance to God’s wishes. In the story of Abraham and Isaac, God orders Abraham to sacrifice is son Isaac. Abraham goes through the motions ready to kill his son when an angel of the Lord appears and tells him to stop. God says to Abraham, “Now I know that you fear God, because you have not withheld from me your son, your only son.” Didn’t he know this before? There are many many more passages like these that show God and Jesus are not omniscient. And it’s logical to dismiss omniscience out of hand just by thinking about the size of the universe and how many particles there are. God would have to know everything about every particle for all eternity. Everything about the number of protons, neutrons, spin, quantum electrodynamics, etc. It’s just too much data. If you are going to believe in a god, the only thing that makes any sense to me is a first cause type of god who put rules into place and those rules play themselves out. It would be like a computer programmer who made a program with some rules and a mechanism for variation. He doesn’t know what will spin out of those rules. All he knows is the rules themselves. I’m not proposing such a being but at least it would match the evidence we see in the universe. Omniscience is an impossible myth and even the Bible doesn’t propose it. ← What year was Jesus born?